A file photo of JSW Steel Ltd.’s Jindal Vijaynagar works, in Bellary. Mumbai: Shares of JSW Steel slumped as much as 5% on Wednesday, dipping to 52-week low, after the company said its Karnataka facility may face a complete closure due to acute shortage of iron ore. The company on Tuesday said that its Karnataka unit may come to a complete closure due to acute shortage of iron ore -- a development that could lead to shortage of steel in the domestic market and increase in prices. Shares of the company opened on a weak note in an already bearish market and then slipped 4.83% to an intra-day low of ₹ 581 on the BSE. They tanked 4.96% to a low of ₹ 580.10 on the National Stock Exchange. The stock however regained some lost ground and was trading at ₹ 582.35, down 4.61% on BSE and at ₹ 581.60, down 4.72% on NSE at 1234 hours. 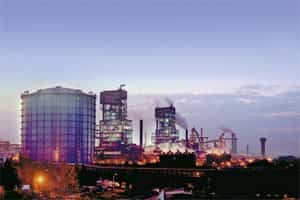 “We may have to shut entirely (Vijayanagar plant)...There is a good possibility of that (closure) if the situation does not improve," JSW vice chairman and MD Sajjan Jindal said. Meanwhile, Steel secretary P K Misra has said that the government will present a fact-sheet before the apex court on how many units have been closed or have resorted to production cut. He sought inputs from the units in the state for the same.